3D Printing materials refers to the materials opted in 3D printing for creating 3D objects. These materials are added in layers to create the 3-Dimensional objects. 3D printing caters to huge application market in medical implants, aircraft, automobiles and many more. In 2017, 3D printing materials market worth $968.6 million and is anticipated to further grow at a CAGR of 29.5% during the forecast period 2018-2023. The materials had immense demand in the North American region and had generated $461.4 million in 2017. In 3D Printing Materials Market outlook, the metal type material is forecast to increase in usage in applications like aerospace and automobiles. The Asia pacific is witnessing huge growth in the market and is forecast to grow at a CAGR of 30.8%. Expansion into new regions, thereby exploring new opportunities in 3D printing materials market will widen the scope of application for this industry leading to a high growth rate. The adoption of 3D printers to visualize and to create extremely customized products will accelerate the 3D printing market which will raise the demands of 3D printing materials. The massive application of 3D printers in medical sector for creating artificial organs such as kidney cells, cardiac tissue, human liver and other human tissues for transplanting is driving the demand of 3D printing materials. Furthermore, cancer cells and other disease cells are also printed to examine and research on the growing cause of these diseases to provide better drugs and therapy to the patients. What are 3D Printing Materials? In 3D printing plastic materials, Injection molding is a technique that has been widely practiced in making different objects. Earlier mud, metals, etc. were the materials molded for making tools and utensils and using very basic techniques. But the technology has led to intervention of modern techniques which are used to mold the materials such as plastics, biomaterials, polymers and thus the term 3D printing. The printing materials exist in 3 forms i.e. filament, powder and liquid and printing techniques such as fused deposition modeling, stereo lithography, selective laser sintering (SLS), Poly jet/ink jet 3D printing , binder jetting, etc. are applied to model various objects of the material. The printed objects are used in various end user industries for manufacturing, producing full-color concept models, architectural models, and visual arts projects. Laminated object manufacturing (LOM) and Electron beam melting (EBM) are also the techniques used to process 3D printing materials. What are the major applications for 3D Printing Materials? The major application of 3D printing materials is in modeling of the projects. The materials after being molded into the desired forms are used to prepare the full-color functional models and visual projects. The simulated designs in the soft wares are printed in reality and 3D printers are available in market according to the type of material. The 3D printing applications by material types are used in various end user industries altogether for different purposes. They are used in Medical industry to make tools and even modern technology has led to printing techniques which can replicate an organ from a tissue of human body. They are further used to manufacture aerospace and automotive mechanical parts and in construction industry to build models the techniques are also used for creating education visual models which the students can see and examine physically and also to make food storage and cooking tools. 3D materials are finding wide range of applications with the growing infrastructure and facilities to IT sector. The metals are usually difficult to machine work or forge in workshops especially when the shapes are sharp and demand is very high. The earlier impossible shapes and applications are now printed using 3d printing metal parts with high precision of design. Aerospace industry is using printing of metallic 3D materials to produce complex designs in a singular part using less material which are light in weight. In addition to the aerospace industry, the demand for 3D printed automotive solutions is anticipated to increase. The concept of 3D printed houses is gaining immense popularity and trending currently. The time of construction for such houses is very low, the processes are still being developed to cut down the build time and increase the efficiency. In medical sector 3D printed materials are used to replicate the bones for replacement and tissues for transplant. The techniques of tissue engineering are being researched to replicate fully functional 3D printing organs which can prove to be a great breakthrough in the medical and health sector of the market. In fashion industry the 3D printed clothes are common nowadays. The shoe industry is majorly impacted by development in 3D printing techniques such as Filament Fabrication technique, Digital Light Synthesis, etc. The printed shoes offer a personalized support for athletes and are allow mass customization. Designers continue to work with 3D printing as it allows to create great designs with a lot of freedom. Big brands are making partnerships with major actors of Additive Manufacturing and are including the 3D printing process in the production of some of their models. 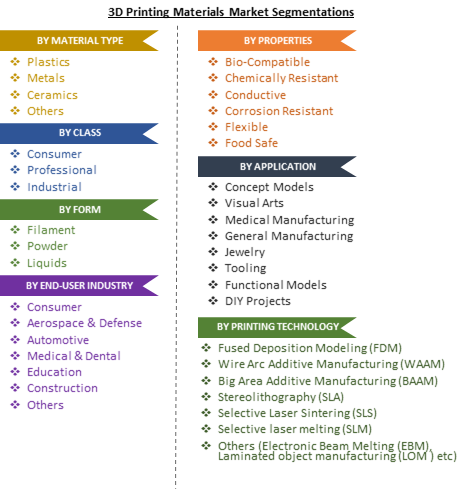 Who are the Major Players in 3D Printing Materials market? The players profiled in the report include 3D Systems, Inc. (U.S.), Royal DSM N.V., Arcam (Sweden), Stratasys Ltd. (U.S.), Materialise NV (Belgium), ExOne GmbH (Germany), Replicator Warehouse, Dutch Filaments, Leapfrog, Imagin Plastics Ltd., 3D Inkspot, Push Plastic, 3D Universal, Rigid Ink, are the major market size and shareholder in the 3D printing industry. What is our report or database scope? 8.3.2.16. Others- Polyetheremide materials-ULTEM, Hybrid Materials, Flexible Materials, Flexible polyester (FPE) etc.